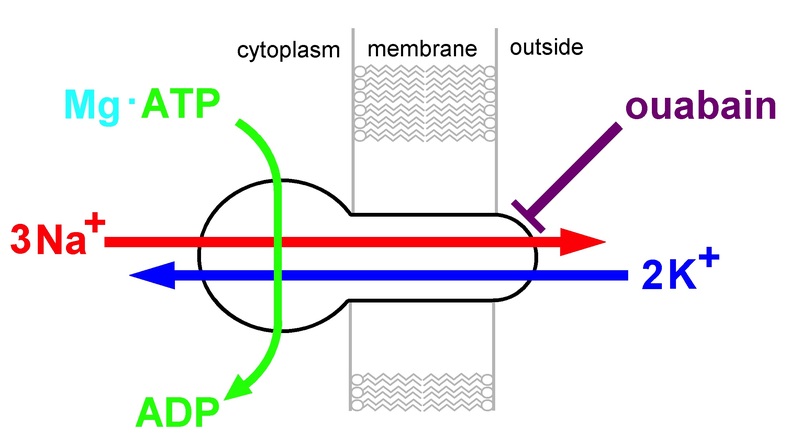 The oppositely oriented concentration gradients of Na+ and K+ ions across the cell membrane as found in animal cells led to the requirement of an active ion-transport mechanism that maintains this steady-state condition. As solution of this problem the Na,K-ATPase was identified, a member of the P-type ATPase family. Its stoichiometry has been defined as 3 Na+/2 K+/1 ATP, and a class of Na,K-ATPase-specific inhibitors, cardiac steroids, was established, which allow the identification of this ion pump. In an effort lasting for several decades structural details were uncovered down to almost atomic resolution. The quaternary structure of the functional unit, either αβ heterodimer or (αβ)n complexes with n ≥ 2, is still under discussion. Hans-Jürgen Apell studied Physics at the University of Marburg, Germany, and graduated in Nuclear Physics. He received his PhD in Biophysics at the University of Konstanz and devoted his scientific work since then to the study of ion-transport processes in biological membranes. In 1983 he began to investigate the transport mechanism of the Na,K-ATPase with optical and electrophysiological methods. In the following years he broadened his interests also by investigations of other P-type ATPases, such as the H-ATPase from Enterococcus hirae, the SR Ca-ATPase, the gastric H,K-ATPase and the KdpFABC complex from E.coli. He is now active as Professor emeritus at the University of Konstanz.